Eid is just around the corner and I have been busy with the preparations. I was making a menu for Eid and thought I should share some of our recipes with you. Eid means ‘feast’. It is when Muslims around the world end their month of fasting with a huge celebration. Different cultures have different traditions. I am not Saudi but this year, I plan to make some of the Saudi Dishes that have become part of our family’s favourite. I hope I can inspire you to try out these recipes in your kitchen too. Here is a Saudi Menu for Eid. These recipes are what we have made a few times through Ramadan too. For example, Samboosak and Hareesa are two things that we often make. If you have older kids you can involve them in preparing them too. My eldest loves to fold the Samboosa and my 3 year old loves to seal them. They also love to break the bread for the dessert Umm Ali. All these recipes are toddler friendly. I have been feeding them to my children from when they were 12 months old. So go ahead and try these. I am sure you would love to include them in your favourites too. Hareesa is a very common oats and meat soup that Saudis love. It is one dish that you will find at almost every table in Ramadan. This soup is perfectly fulfilling as itself with a little bread or khubz if you like. You can use either chicken or mutton for the meat and they both have a distinct taste. Here is how to make it. Boil chicken/mutton with some salt and garlic and ginger paste in a liter of water to tenderness. Remove the meat and keep aside after shredding it and removing the bones. Bring the remaining stock to boil with cardamom , cinnamon stick and clove. I like to use a small strainer to holds these spices. If you don’t have a herb strainer then you can use it as it is and remove it later. Add a cube if chicken/mutton stock to it for more taste. When the stock is boiling, add a cup of oats, one puréed tomato and the shredded chicken. Stir and allow it to thicken gently. Let it simmer for 15 minutes. Add a few chopped parsley leaves before serving. Samboosak is also called samboosa. 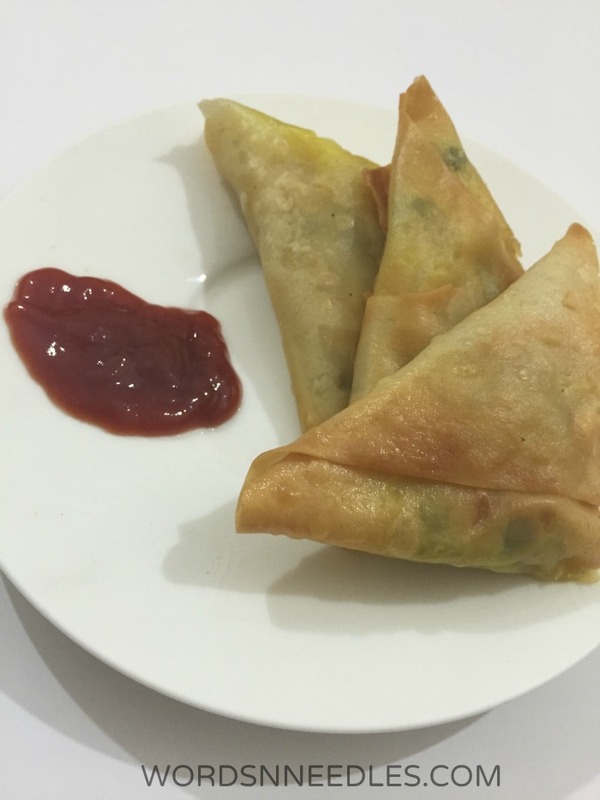 It is very similar to the desi Samosa. Samboosak is made from long strips of pressed dough that are easily available everywhere here. We find ours in the breads section but you can use filo pastry leaves too. YOu can alternatively make them fresh using flour, oil, salt and water. Just roll them out very thin, dust with flour, fold them in half and roll again. Continue doing this till they are paper thin. Yes, I know it looks hard and takes practice! Don’t worry too much about the shape because you will be folding them. The fillings vary from minced meat to cheese to spinach to peas. You can use whatever you fancy. My kids love it with potatoes and peas too but I am sharing the minced meat version here. Sauté the onion in a table spoon of oil. Once it is translucent, add the ginger-garlic paste. Add the chilli, mix well and add the peas. Fry the peas a bit and then spread a layer of mince meat. Close the lid without stirring. Simmer till the steam builds and the meat leaves its water. Break the mince that will have clumped. Add salt to taste. Increase the heat and fry till the water has absorbed. Let this cool. Spread the separated samboosa leaves on a flat surface. Place a few clumps of meat mix on one side and start folding it into triangles. Fold into a triangle and then again till you have a little triangular wrap. Seal the edge with water or a little dough paste to keep it together. Shallow fry these in hot oil till golden. Drain on paper tissues. 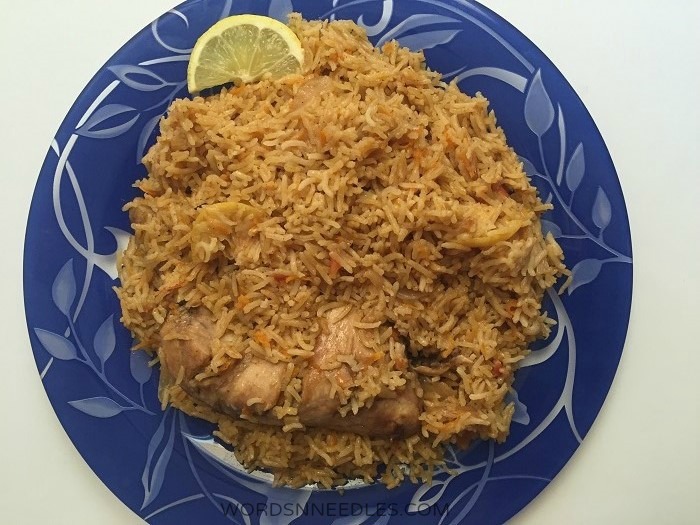 Kabsa is a chicken and rice main course that is very common in the Arab world. The Saudis call it Kabsa with chicken and with mutton they call it Mandi. 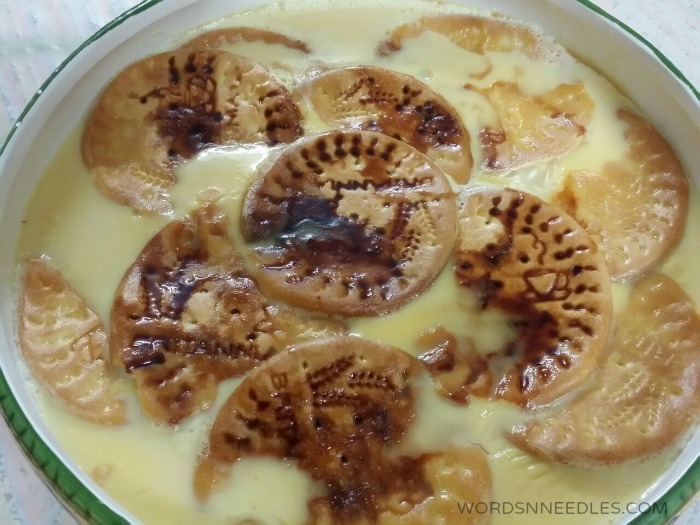 I have recently guest posted at Maroc Mama at the Recipes from the Arab World Series. Here are the ingredients. Hop on over to Maroc Mama for the Recipe. 1 chicken with skin, cut into 4-8 pieces. GET THE FULL RECIPE FROM MAROC MAMA at the Recipes from the Arab World Series. Kabsa is usually eaten with a watery tomato sauce. We like it as it is but this tomato sauce is really a fresh taste that I have to share! a tomato, some lime juice, a green chilli. Put all the ingredients in the blender and blend it. Pour it out and serve! My husbands favorite type of dessert! The name translates to mother of Ali. I have no idea why it us called that but it is delicious and so simple. Umm Ali is actually the Arab version of bread pudding that is made with puff pastry. We use store bought croissants but you can make your own fresh puff pastry puffs to use too. Croissants, double cream, condensed milk, toasted and flaked almonds, pistachios and pine nuts, raisins (that have been fried in a little butter) and coconut flakes (if you like). Break the croissants into bite size pieces and place in a layer in a baking dish. Mix double cream and condensed milk in a bowl with 2-3 tablespoons of water. Heat it slightly and pour it on the croissants. Sprinkle with dry fruits. Repeat another layer of these and top with more cream. Bake in an oven at 365 degrees till you see the top browning. Remove and cool before serving. 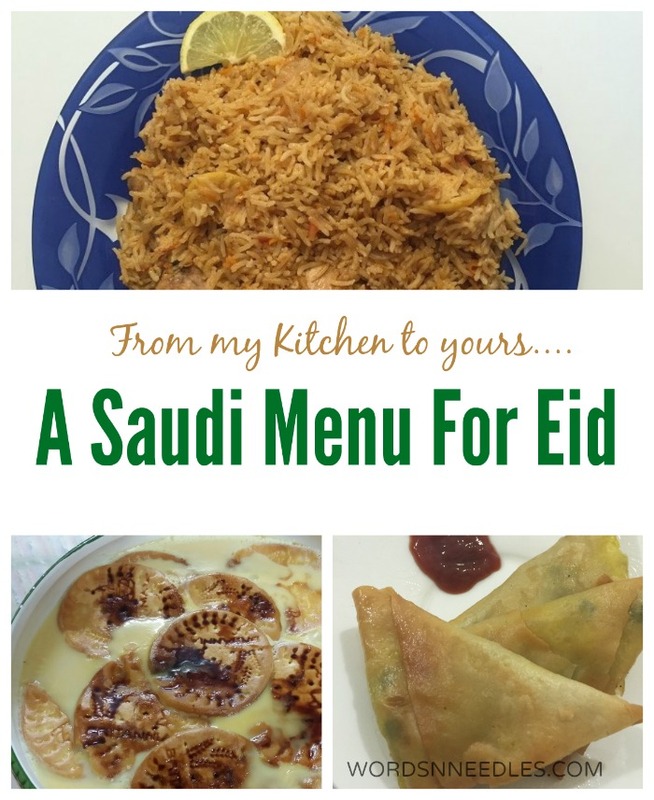 I hope you will try our recipes and enjoy this Saudi Menu for Eid. Wishing you a happy feast! Hop on over to my Facebook page and tell me how it goes. I’d love to hear from you. 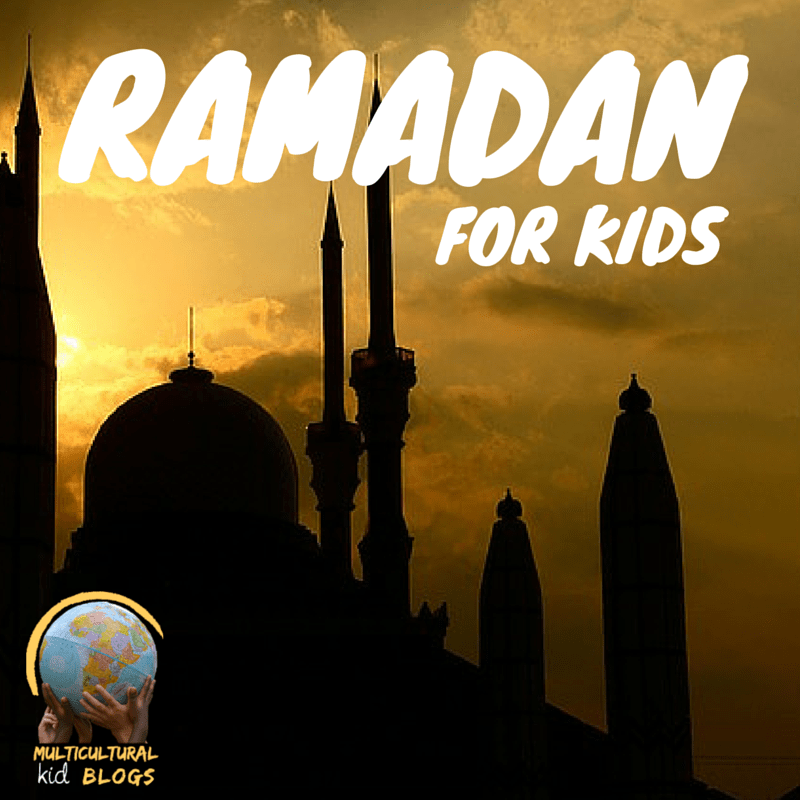 This post is part of the Ramadan for Kids blog hop on the Multicultural Kids Blog. 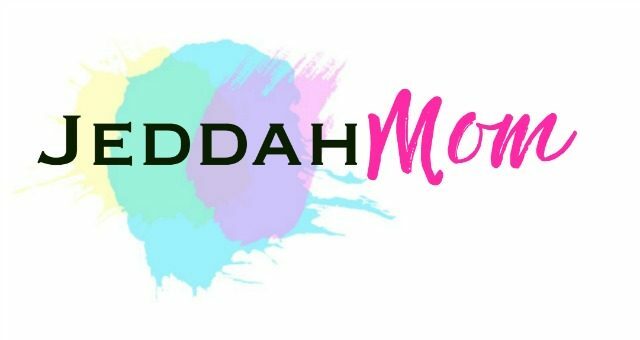 Join me and the other bloggers from the 8th of June to 9th July 2015 as we share some fantastic arts, crafts and parenting tips for you. Hop on over to our Facebook Pages for more ideas. Jeddah Mom on Facebook. Multicultural Kids Blog on Facebook. ur kabsa recipe doesn’t exist at marocmama any more ..may be she has removed it . plz update the post wid ur recipe..